A painting depicting Jesus Christ was spared from the flames after a 150-year-old church suffered severe damage after a lightning set the building ablaze. Lightning struck the 180-foot steeple of the First Baptist Church in Wakefield, Massachusetts, Wednesday night as severe storms rolled through the area, setting the church afire and nearly burning it to the ground by morning, ABC Boston affiliate WCVB reported. Images show the roof of the structure burnt almost all the way through. 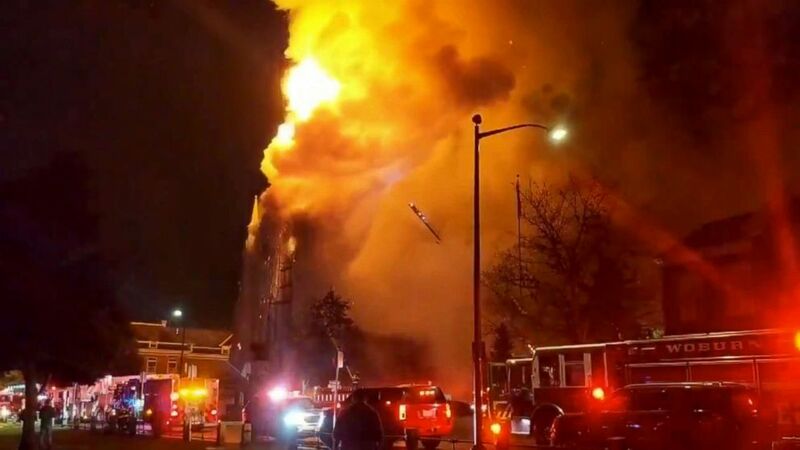 Most of the items inside the church, home to community meetings and a preschool, were destroyed, including "a lot of beautiful musical instruments," church moderator Melinda Parry told WCVB. But, not all was lost. Somehow, a large portrait of Jesus Christ set on a cloudy blue background survived the blaze intact. Video footage show by WCVB shows a firefighter carrying the untouched painting away from the site, surrounded by ash and soot. The survival of the painting may be a metaphor for faith and spirituality, First Baptist Church Pastor Norm Bendroth told WCVB. "Our faith is one of hope and resurrection," he told the local station. "We believe you can rise from the ashes, and joy comes in the morning." Firefighters attend to the scene of a large fire in a church in Wakefield, Massachusetts, Oct. 23, 2018. The fire rang in at 7 alarms and caused more than $1 million in damage, The Boston Globereported. Church members became emotional as they watched crews work to demolish the building on Thursday. People are in "disbelief," Bendroth said. Firefighters attend to the scene of a large fire in a church in Wakefield, Mass., Oct. 23, 2018. "Many of them were born in this town. They were baptized in this church," Bendroth said. "You know, they were hoping to die in this church." Churchgoer Elaine Schindle likened the loss to "a death in the family." 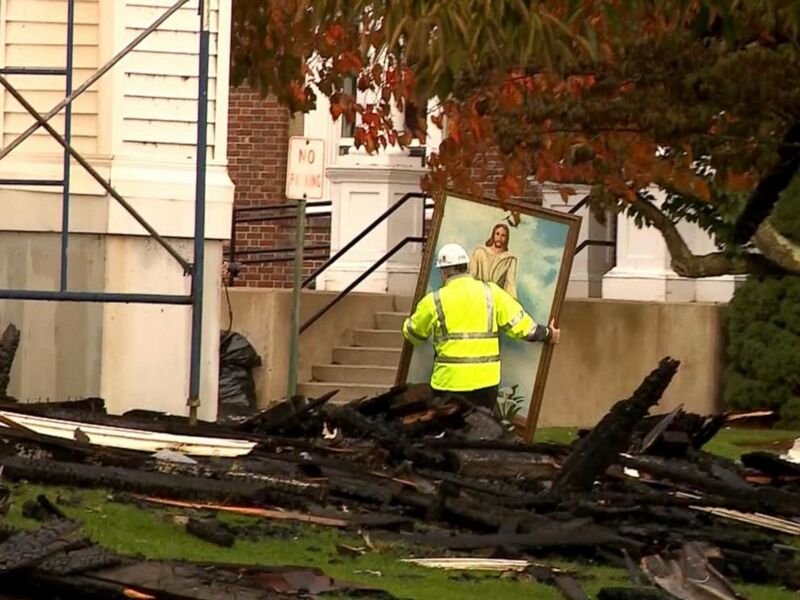 A painting of Jesus Christ survived a fire that destroyed the First Baptist Church in Wakefield, Massachusetts. 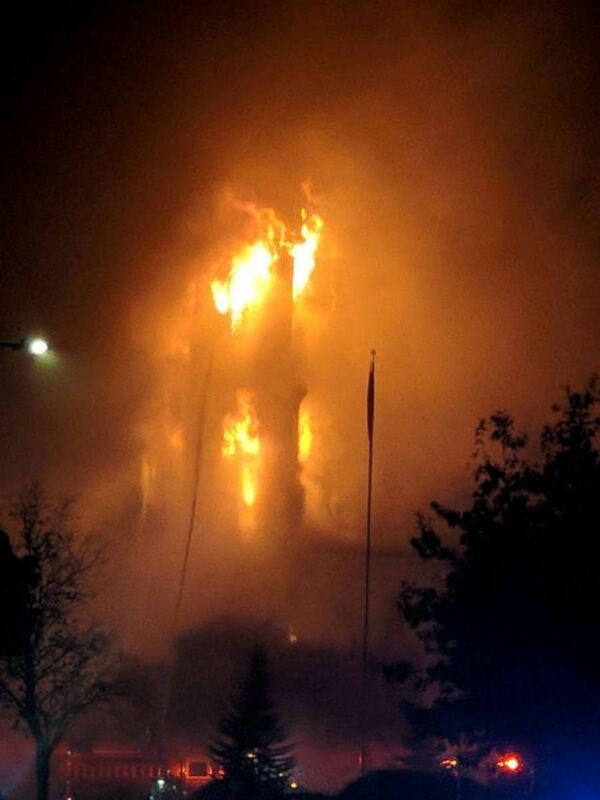 Another church member, Chris Rankin, said the fire was "unexpected and shocking." "It's been very important to us and our family," she said. "We come every Sunday."